Builder Ned Jack Shipyards by the Williams Bros.
Lone Dove worked out of Port Sorrell and is now in Survey to carry 6 passengers around St Helens as tourists. Les Sims was the baby of fishing parents, sailing out of Devonport on their couta boat, when the young Queen Elizabeth gave them a wave from Victoria Parade. It was 1954 and possibly, the quaint sense of family and tradition was what caught the young Queen’s eye. “Mum and dad fished together, they were couta fishermen and shark fishermen and dad used to build little boats, dinghies and all sorts,” Mr Sims said. 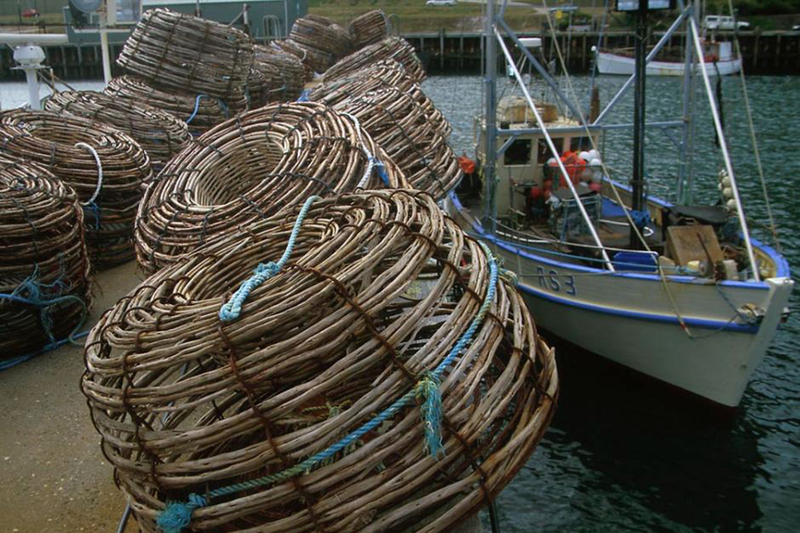 “When I was a baby, they just put me in the couta boat and we’d be off cod fishing, down the river. Sixty years later, Queen Elizabeth is still on the throne and Mr Sims still spends his life on and around boats. 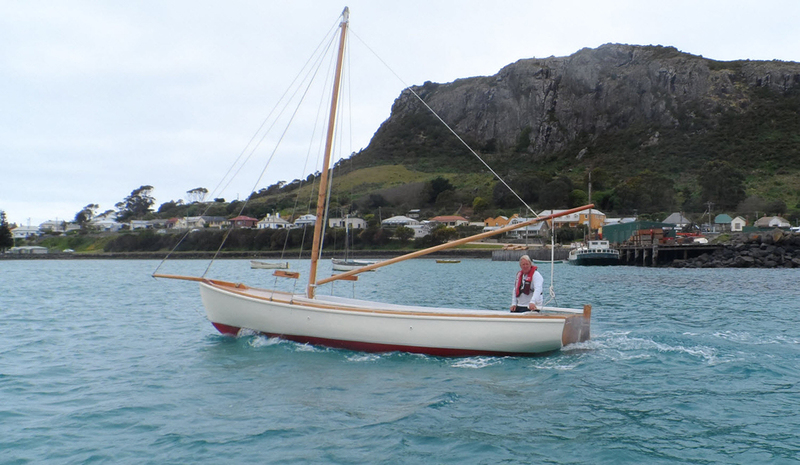 In an old TasPorts shed on the Stanley Wharf, Mr Sims has been restoring rotting wooden boats to their former glory. It is a breathtaking workplace, with waves going past the wharf visible through the back window and Stanley’s huge volcanic plug headland, The Nut, rising out of view through the big sliding door at the front. A couple of old and worn whalers lie nostalgically by the fence outside, awaiting Mr Sims’s skill and attention. For the past 20 years, Mr Sims has worked a lot with a young people who have who have fallen foul of the law and such work has been central to his operation on the Stanley wharf. “For the last four years here in Stanley, we’ve been running a youth justice program with young offenders who have to do community service,” Mr Sims said. “Any building or restoring we do, they get involved with that. “We try to work them through a new direction in their life, give them something positive, give them a little bit of self-esteem. After a childhood spent on the water, Mr Sims could well understand that not every young person feels comfortable in the school system. The difference for him was, he always knew where he was going — to sea. “I went to school at least two to three days a week — that was my maximum until my final term of high school, when dad said ‘if you pass you can leave school’, so I went every day,” he said. At age 10, he was helping his dad build ‘flatties’ or little netting dinghies and built his own dinghy for the first time in grade five. Over the years, Mr Sims has worked as a fisherman, a boat builder and even skippered a boat to Antarctica. Most recently, he had a flirtation with the film industry and scarcely had to leave his beloved wharf shed to do it. The major Dreamworks motion picture, the Light Between Oceans, will be released later this year. In it will be a swathe of Stanley locals, including Les, who was actor Jack Thompson’s body double. “I was part of the crew for marine co-ordination and was Jack Thompson’s double when bringing the boat into the wharf, [for] sail-pasts [and] those sort of things,” Mr Sims said. 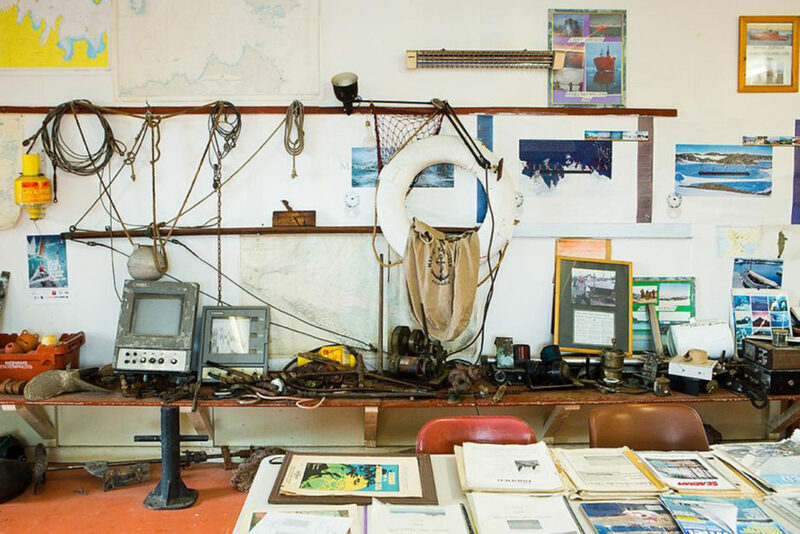 Adjoining his workshop space, Mr Sims has established a small maritime museum, his heritage room, filled with the remnants of a life lived on and around boats. A lot of the items are his own memories, including numerous, nostalgic sailing and boat-building magazines. He even has the original lead line he once used to help his father sound depth and establish what kind of bottom lay beneath their boat. The string is marked in fathoms and feet (a fathom is 180cm) and for Les, it is by far the most nostalgic item in his collection — a direct connection to a youth spent working closely with his parents at sea. Another highlight of the collection is the steering wheel and telegraph post from the 131-tonne Lady Flinders, wrecked off Three Hummock Island in 1938. 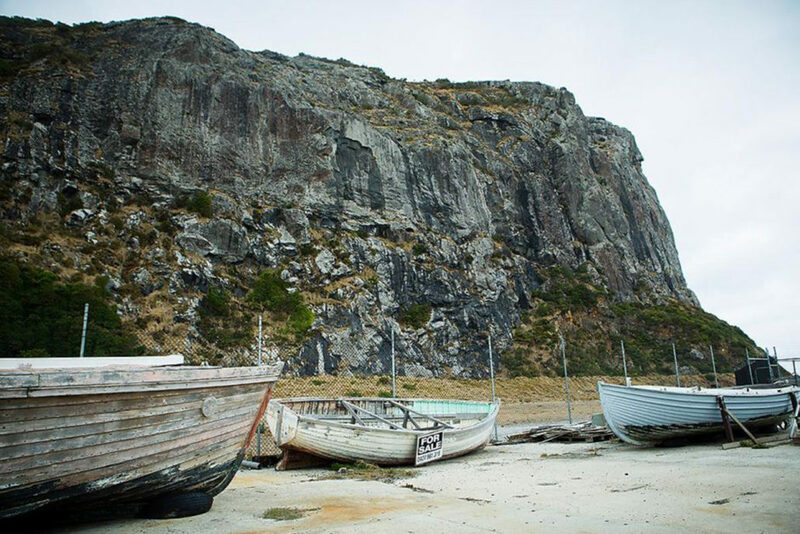 We were fortunate to stumble across Les Sims and his beautiful little Couta boat ‘Lone Dove’ whilst travelling Tasmania and visiting St Helens back in March 2016. You thought you were going to just have a leisurely cruise around the bay and catch a fish or two. Well, there’s that and more…. Les is a great bloke, happy to share stories about his life as well as information about the area. The fishing was prolific and we were fortunate to catch a barracouta too – how appropriate. 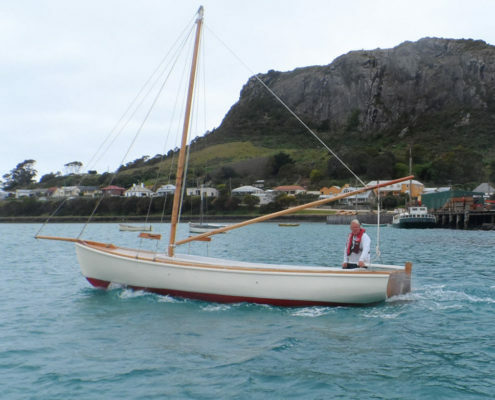 The boat is about to be featured in a movie, to be released in September, so look out for that – “The Light Between Oceans”. Thank you Les for making us so welcome and for making our cruise one of the best things we experienced on our whole trip in Tasmania.